THOMAS JEFFERSON. Printed Document Signed, as Secretary of State, “An Act supplemental to the act for making farther and more effectual provision for the protection of the frontiers of the United States,” Philadelphia, March 28, 1792. 1 p., 9½ x 15¼ in. As early as March 9, 1792, President Washington consulted with his department heads about federal military appointments, discussing eight possible commanders. Around that same time, Washington prepared an annotated list of sixteen officers throughout the country, as low as brigadiers, to consider for commander in chief. On April 9, 1792, he nominated Anthony Wayne for promotion to major general and command of the army, and Daniel Morgan (1736-1802) of Virginia, Marinus Willet (1740-1830) of New York, John Brooks (1752-1825) of Massachusetts, and James Wilkinson (1757-1825) of Kentucky for promotion to brigadier general. The Senate quickly confirmed Wayne. Initially having sense enough to refuse Wilkinson’s confirmation, the Senate relented on April 16 (The kindest thing we can say about Wilkinson is that he, like Aaron Burr, was never convicted of treason). Morgan, Willet, and Brooks were all confirmed, but they each declined. In their places Washington nominated Otho H. Williams (1749-1794) of Maryland, William Hull (1753-1825) of Massachusetts, and Rufus Putnam (1738-1824) of the Northwest Territory. Williams and Hull also declined. These nascent moves to defend the United States had far-reaching economic effects. When Alexander Hamilton had presented to Congress his Report on Manufactures on December 5, 1791, Congress promptly tabled it. Though it is now acknowledged as one of the greatest of American economic papers, Hamilton recognized that Congress did not have the appetite for another major debate on economic policy. (He had won a hard-fought battle for the Assumption Plan less than two years earlier.) But in March 1792, when Congress requested ideas to raise additional revenues needed to defend the nation’s western frontiers from British forces and their Indian allies, Hamilton proposed most of the tariff measures he had come up with in his Manufactures report. On May 2, 1792, Congress passed “An Act for raising a farther sum of Money for the Protection of the Frontiers,” which enacted import tariffs to fund the army, thus also achieving many of Hamilton’s measures to boost American manufactures. A further act, passed May 8, relied on the individual states to organize, train, and supply the militia. Most importantly, it provided for the conscription of every “free able-bodied white male citizen” between the ages of 18 and 45 into a local militia company. (This was later expanded to all males, regardless of race, between the ages of 18 and 54 in 1862.) The federal standing army remained relatively small through the nineteenth century, despite repeated demonstrations of the inefficiency and inadequacy of relying on state militias to meet the manpower needs of an army. 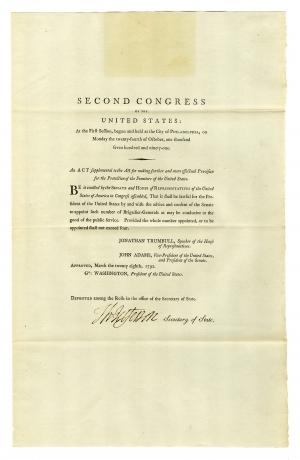 According to the provisions of the 1789 “Act to provide for the safe keeping of the Acts, Records, and Seal of the United States, and for other purposes,” the Secretary of State was responsible for receiving signed bills, orders, and resolutions from the President.” It also directed the Secretary to ensure that all such acts were published in at least three public newspapers and to deliver two printed copies “duly authenticated” to the governors of each state. This copy is one of those authenticated by Jefferson as Secretary of State and sent to one of the governors. Kentucky was not admitted as the 15th state until June 1, 1792, so Jefferson very likely signed only 28 copies of this Act. Pale rectangular stain to top margin. Otherwise fine. of March, one thousand seven hundred and ninety-two. BE it enacted by the Senate and House of Representatives of the United States of America in Congress assembled, That it shall be lawful for the President of the United States, by and with the advice and consent of the Senate, to appoint such number of brigadier generals as may be conducive to the good of the public service. Provided the whole number appointed or to be appointed, shall not exceed four. GEO WASHINGTON, President of the United States. Deposited among the Rolls in the office of the Secretary of State.